When co-workers Sharon Tomaselli and Bob Sweitzer left the struggling paper business, they decided to go into business together, although they just needed to figure out what kind of enterprise that would be. As they visited various types of businesses with the intent to buy into one or to buy one outright, Bob noticed that Sharon was eating cheese every day. Shortly after, as fate would have it, Bob found a building that was designed to be a cheeserie, but no cheese had ever been made there. In 2007, Bob and Sharon purchased the building and the Cooperstown Cheese Company was founded. Sharon still eats cheese every day and making cheese is now a passion for the both of them. 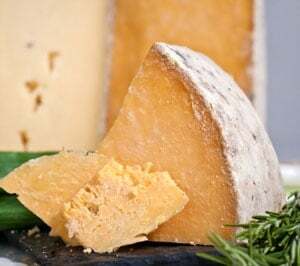 Over the past decade, Cooperstown Cheese Company has won two American Cheese Society awards, including one for their own recipe, Jersey Girl, in 2013. Cooperstown Cheese Company doesn’t own any animals, giving them more flexibility to make all kinds of cheeses. They do, however, only use hormone-free milk from top quality farms, and they also make sure that the animals have plenty of outdoor time. For the cheese in your shipment today, Jersey Girl, they buy Jersey cow milk from Stone House Farm in Sharon Springs, NY. These particular cows are out grazing during the warmer months and are let out for shorter periods in the winter to ensure healthy and happy cows. 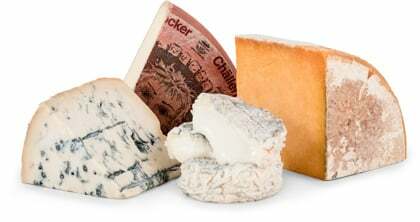 For some of the other cheeses they make, depending on the flavor that they want and the type of milk they need, they will use various other dairies, but all will have the same high standards. In total, they make about 20 different cheeses annually, but some are seasonal depending on the ingredients. Being the only employees, Sharon and Bob are true artisans, literally hand-crafting each and every cheese themselves. All of Cooperstown Cheese Company’s cheeses are made from high quality, raw milk. Jersey Girl is a washed curd cheese which makes it stay creamy but also allows for big, yet mellow, flavors. The yellowish color is naturally-occurring as Jersey cow milk is a pale yellow which deepens when the cows are on pasture. The rind is natural and edible, but a bit more chewy than the interior. Bright and earthy, this cheese is wonderful on its own but also pairs wonderfully with bright fruits like apples. It also makes a great accompaniment to salads and sandwiches, and also excels when melted on turkey burgers. As for beverage pairings, try a fruity white like Pinot Grigio or Sauvignon Blanc, or a light effervescent wine like a Cava which will complement the light and refreshing nature of the cheese. It also goes well with a Belgian Witbier. As always, remember to bring your cheese up to room temperature before enjoying.